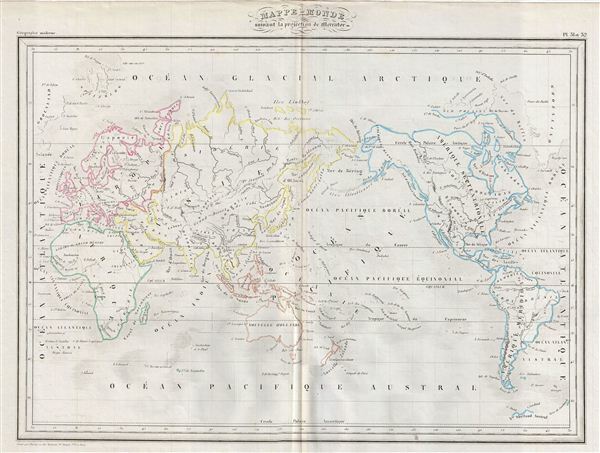 This is a fine example of Conrad Malte-Brun's 1843 map of the World on Mercator's Projection. An interesting map of the world issued just as most of the earth's non-polar shore has been explored. Gone are many of the errors of the previous century with the coastlines of the Arctic, the American Northwest, Australia, and New Zealand accurately rendered. Inland though, much remained confused. Vast stretches of unmapped territory and speculative cartography fill central Asia, the western United States, Africa and Australia. Various cities, towns, rivers, lakes, mountains and other topographical details are marked, with relief shown by hachures. Boundaries are color coded according to countries and territories. This map was issued as plate nos. 31 and 32 in Conrad Malte-Brun's 1843 Precis de la Geographie Universelle. Very good. Minor creasing on original centerfold. Blank on verso.